Do you have clients who own my529 predetermined Age-Based or Customized accounts? If you do, you should know that my529 has added the PIMCO Interest Income fund, a stable value fund, as an underlying investment to all predetermined Age-Based investment options, effective August 17, 2018. The new fund is also available as an option to owners of Customized Age-Based and Customized Static accounts who design their own investment allocations. PIMCO Interest Income Fund focuses on preserving principal and providing liquidity while generating steady returns for my529 account owners saving for higher education. The fund invests in high-quality government and corporate bonds with short- and intermediate-term maturity dates. The fund is run by Pacific Investment Management Company (PIMCO), a Newport Beach, California, investment firm with $1.71 trillion in assets under management as of June 30, 2018. The introduction of the PIMCO Interest Income Fund reduces the allocation percentages of the Vanguard Short-Term Investment Grade Fund and the FDIC-insured accounts in my529’s predetermined Age-Based investment options. You can view the new asset allocations and glide paths for the predetermined Age-Based options below. The change is automatic, and no action is required by owners of predetermined Age-Based accounts. The addition of the fund does not count as an investment option change for account owners in the predetermined Age-Based investment options. Customized Age-Based and Customized Static account owners who opt to invest in the PIMCO Interest Income Fund can determine the allocation percentage that is appropriate for them. However, adding the fund to a customized investment option will count as one of two allowable investment option changes in a calendar year. 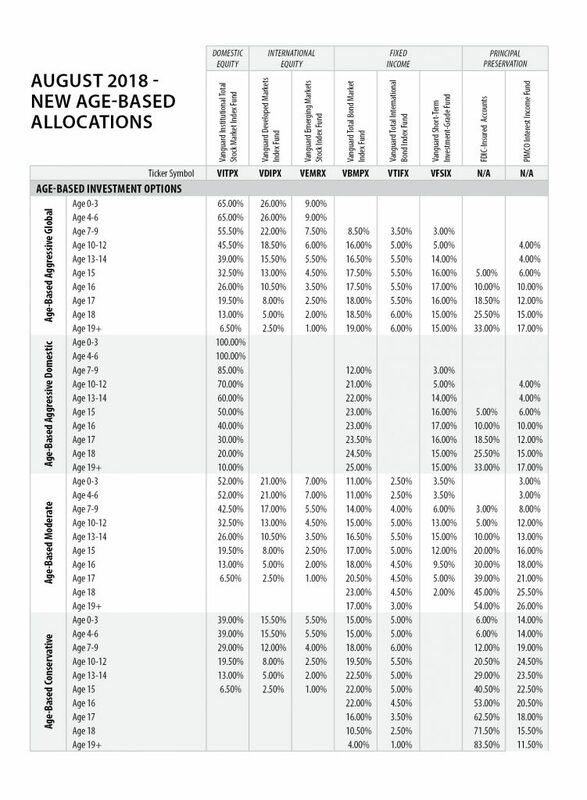 Predetermined Static investment options are not affected by the change. Note: The PIMCO Interest Income Fund may increase the annual Asset-Based Fees for the predetermined Age-Based options, depending on the portfolio applicable to the age bracket of the beneficiary. The initial investment management fee for the new fund is 0.129 percent. Less price volatility and potentially higher returns may offset any higher cost. Read the PIMCO Interest Income Fund Fact Sheet for more information. If you have questions about the PIMCO Interest Income Fund or changes to the predetermined Age-Based options, contact my529 Professional Services Team at advisorinfo@my529.org or by calling 888.529.1886.